Disneyland has an amazing array of activities to celebrate Christmas and the holiday season. We did not want to miss any of the special Disneyland holiday details, so we decided to book our first ever Disney tour. 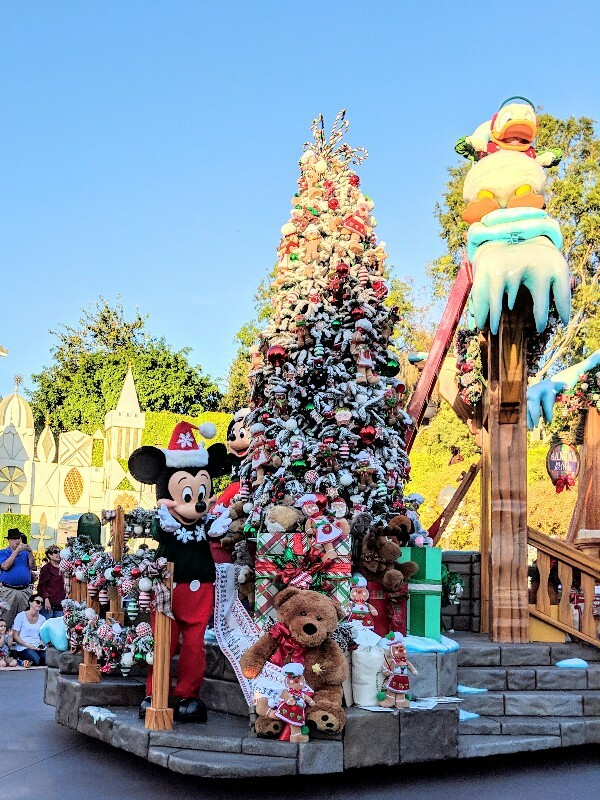 The Holiday Time at the Disneyland Resort Tour was a unique experience and provided us a memorable afternoon immersed in the holiday spirit topped off with amazing parade seats. Check here for more information about Disneyland at the holidays. 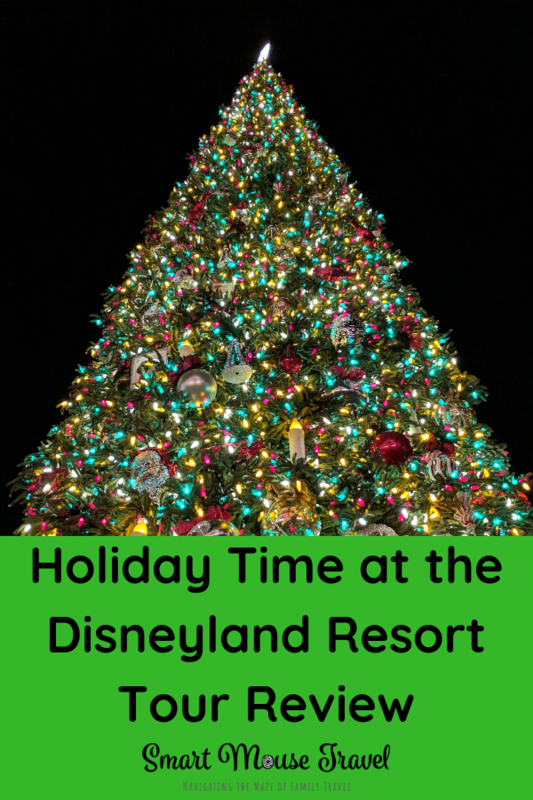 What is The Holiday Time At The Disneyland Resort Tour? 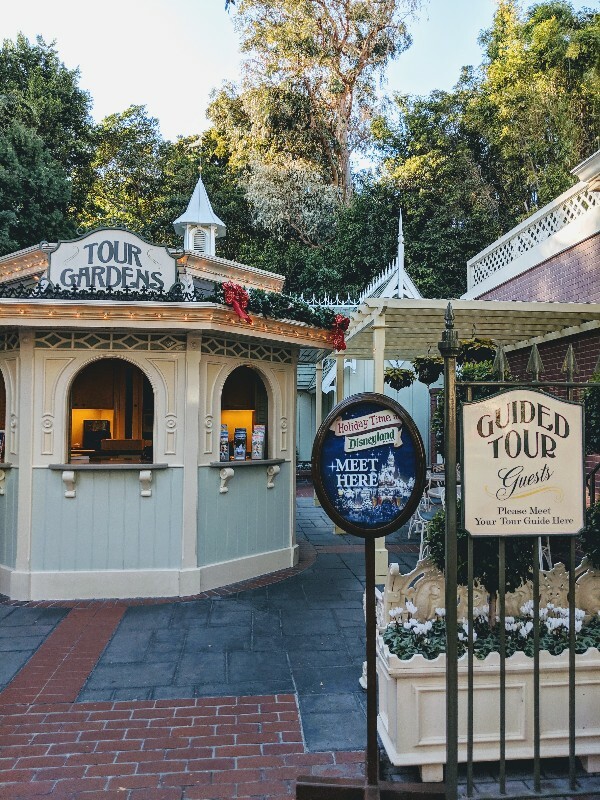 Holiday Time At The Disneyland Resort Tour is available seasonally and is a guided walking tour with a Disney tour guide. This 2½-hour group tour takes you through both Disney California Adventure and Disneyland Park holiday decorations. Our tour also included a ride on It’s A Small World Holiday before ending at reserved seating for A Christmas Fantasy Parade. 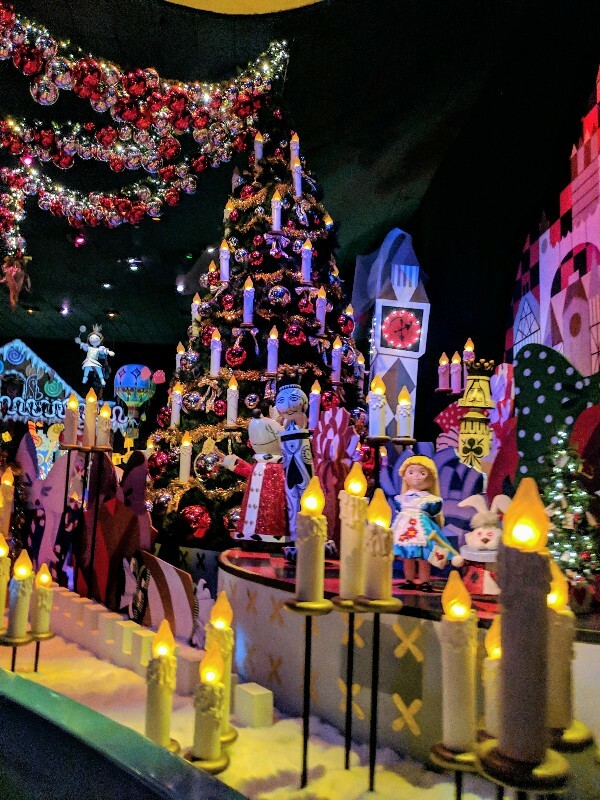 Please note: The official tour information states your guide will show decorations at both parks and have reserved parade seating to end the tour. The ride on It’s A Small World Holiday was a surprise to me. When I booked the tour staff members told me the ride was not specifically included. Our guide, Kayla, was incredible and knowledgeable about the parks. She did a great job of teaching our group how the holidays are celebrated at Disneyland. In fact, Kayla went out of her way to answer all the questions Elizabeth had about the park decorations and even non-holiday questions, too. 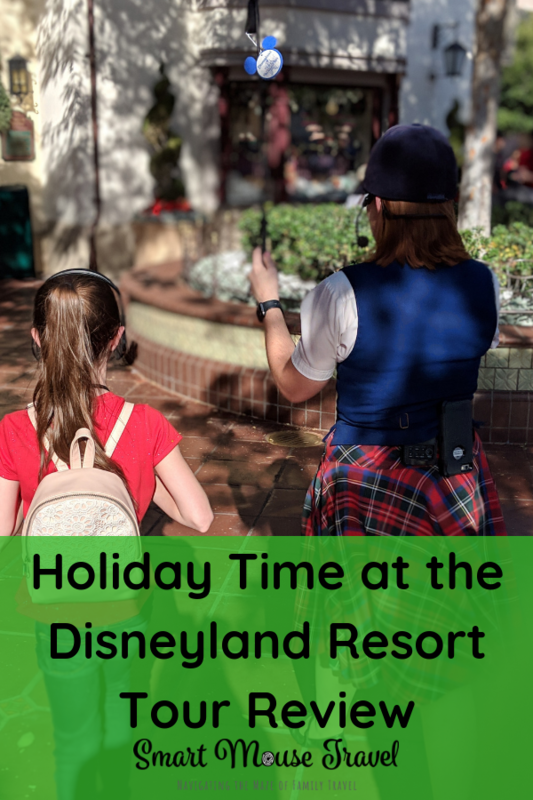 What Should I Expect During The Holiday Time At The Disneyland Resort Tour? You will check in for the Holiday Time At The Disneyland Resort Tour about 30 minutes prior to your tour start time. When you enter Disneyland Park go through the left side opening under the train tracks. Tour Gardens is a small white building located just past the tunnel on the left. I had never noticed it before, but immediately spotted it once I knew what I was looking for. We were asked about food allergies as we checked in for Holiday Time At The Disneyland Resort Tour. Unfortunately, my daughter does have an uncommon food allergy which I shared with the cast member. There are three treats provided during the tour and all three had the potential to be an issue. The cast member kindly provided Elizabeth three special snack vouchers that then she was able to use to obtain her own safe treats. Find out more about dealing with food allergies at Disneyland here. 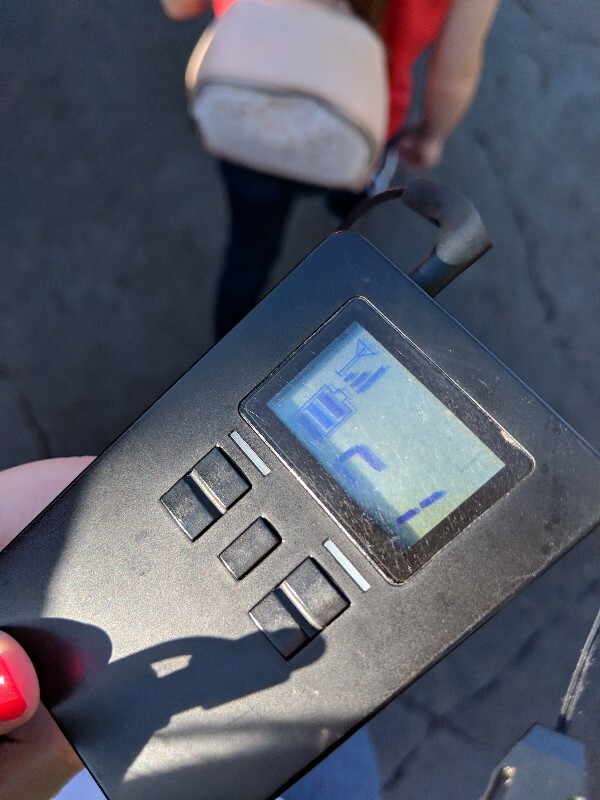 Right around our scheduled tour start time, Kayla began passing out headsets to everyone in the group. These headsets are pretty amazing. Kayla was able to speak into her microphone and everyone could clearly hear her on the headset. I thought this was especially impressive since the park was crowded and loud on our tour day. After everyone had their headsets set up it was time to start. We left Disneyland and walked over to Disney California Adventure to begin our tour. A cast member opened a side gate to allow us entry into the park instead of having to enter through the regular line. 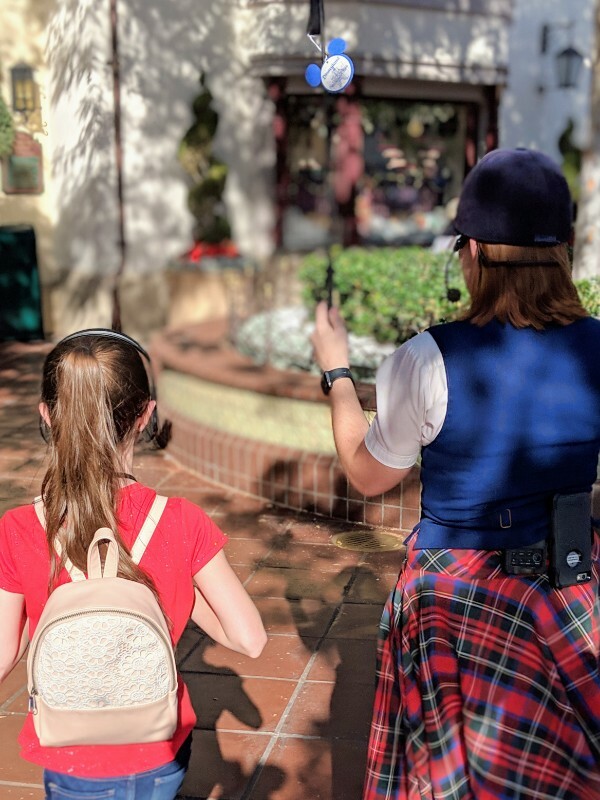 Once we were all inside the park, Kayla began to show us special details around Buena Vista Street. After this we made our way up the street to admire the Christmas tree near Carthay Circle. Once we arrived at the tree, Kayla showed us some fun details on and under the tree, but I won’t spoil the specifics. After she finished her speech we then heard an audio recording of Walt himself talking about a special Christmas gift he gave his wife. 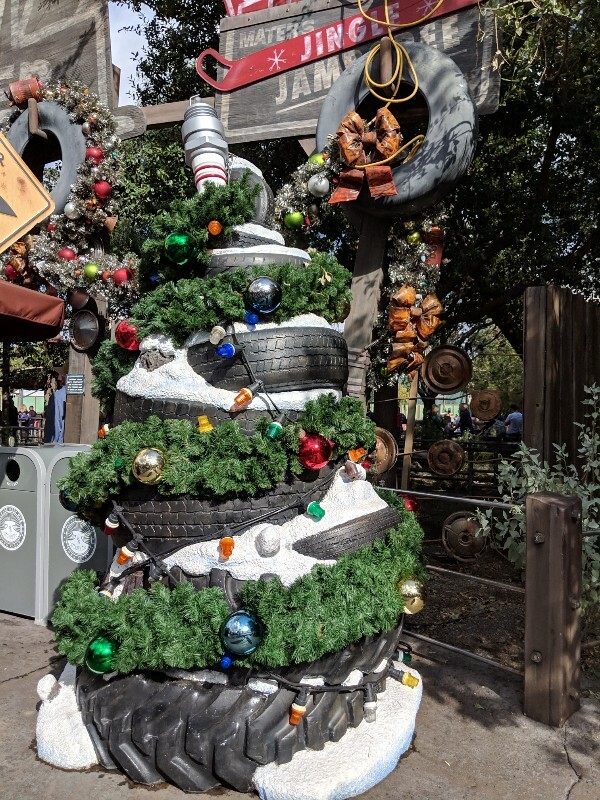 Next we moved to Cars Land where Kayla pointed out many of the special Christmas details. Since this was the last day of our trip we had already spent a lot of time in this area. Kayla joked that Elizabeth could have given the tour for that section and loved that Elizabeth was so into the intricate details. From there we walked past Grizzly Peak and made our way to Trolley Treats back on Buena Vista Street. Here we learned about the history of gingerbread houses and the Disneyland Candy Cane tradition. Once we were done learning we were rewarded with some amazing chocolate peppermint fudge. 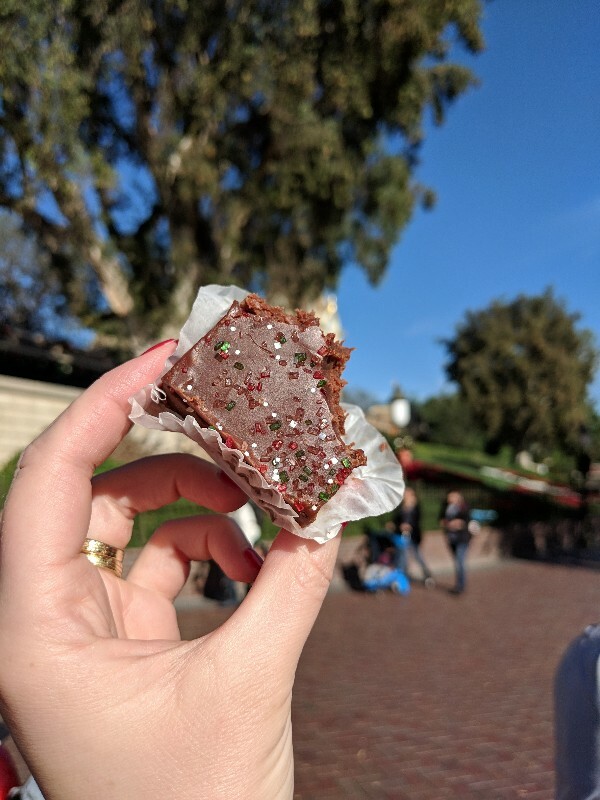 Mr. Smart Mouse and I shared the huge chunk of fudge as we walked back over into Disneyland Park. Our first stop back at Disneyland was Main Street where we could admire the massive 60-foot (20-meter) Christmas tree. 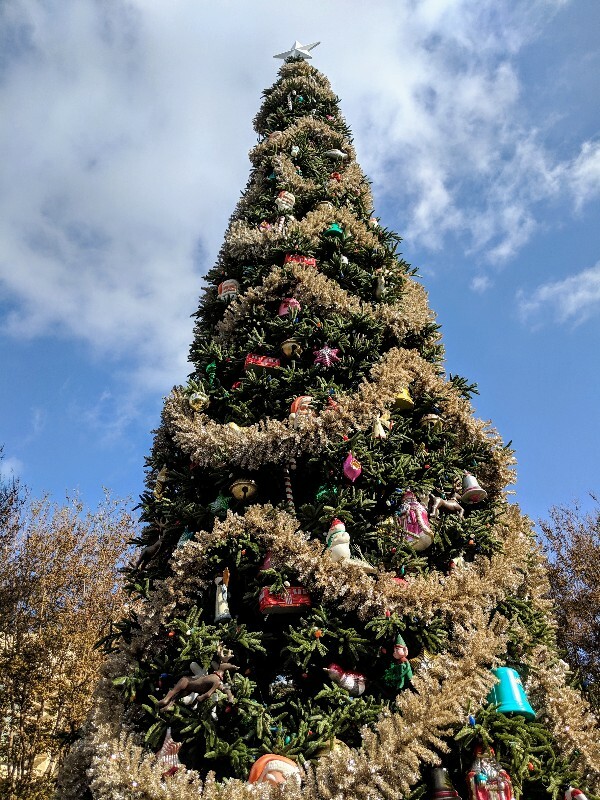 The tree is such an important part of Disneyland that all year long the spot where it sits is called Christmas Tree Point. This is true even when the iconic Mickey pumpkins reside there. 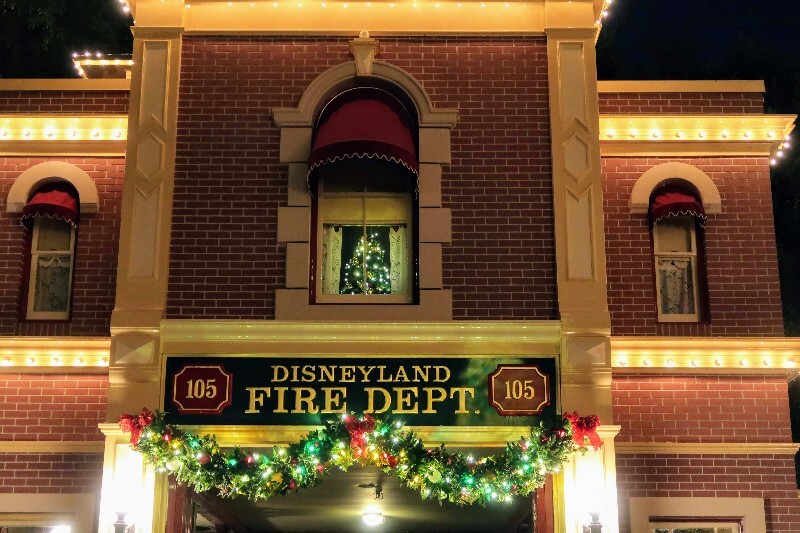 Kayla also showed us a Christmas tree in the window above the Disneyland Fire Department. This apartment was once used by Walt and his family. The Christmas tree in the window remains lit 24 hours a day throughout the holiday season. We went back later that evening to see the tree more easily in the dark. From Main Street we walked to the area near Jungle Cruise. Here Kayla pointed out the jungle inspired Christmas tree and then gave us a small break. We had the opportunity to run to the bathroom and grab a drink from the nearby stand before resuming the tour. Next we went to New Orleans Square to learn about the Haunted Mansion Holiday overlay, but did not ride or see the outside in depth. Our guide also showed us other decorations in the area and taught us about Papa Noel, the Cajun version of Santa Claus. From New Orleans Square we walked as a group past Frontier Land before arriving at It’s A Small World Holiday. Here I was surprised to find that we were going to have specialty access to ride this amazing holiday attraction. We rejoined our guide as we exited It’s A Small World Holiday, and were then ushered to our reserved seating for A Christmas Fantasy parade. 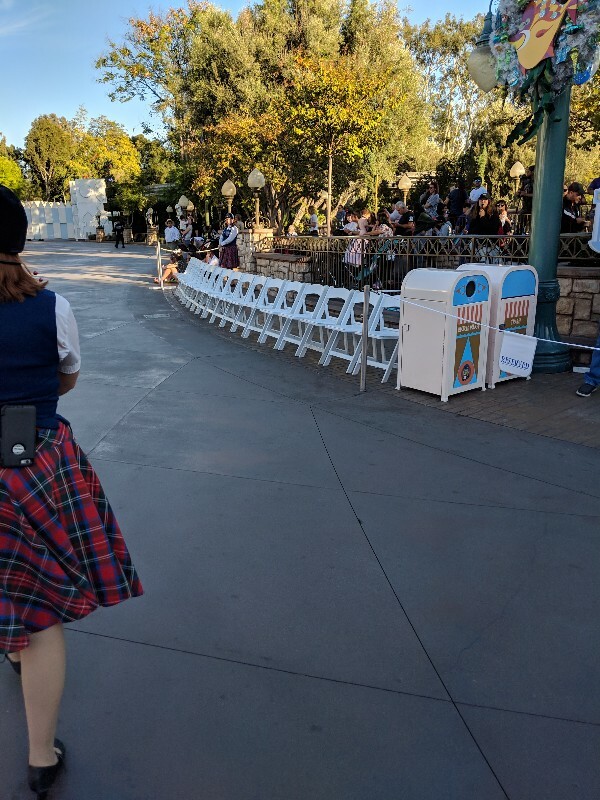 A single file line of chairs was waiting for us across from It’s A Small World Holiday. The reserved parade seating is in a great location and having a seat for a parade was such a treat. 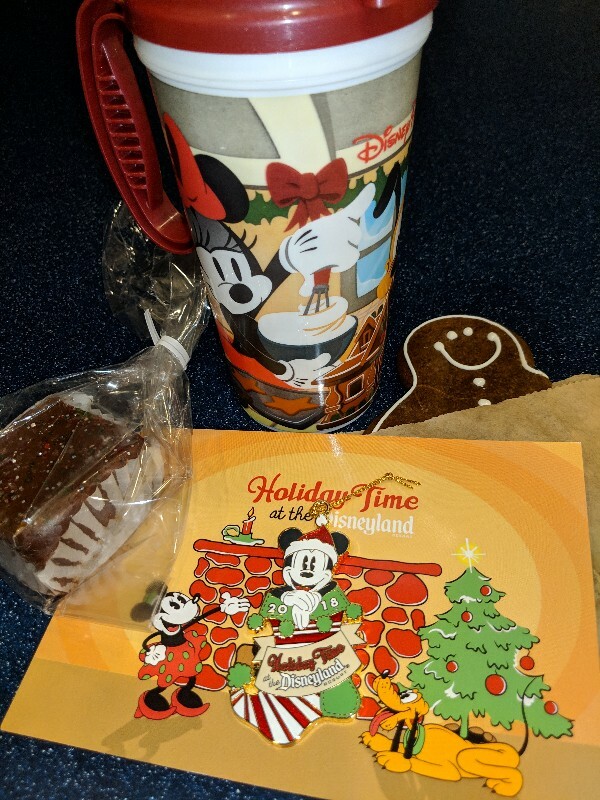 As soon as we were seated our guide passed out Gingerbread Men cookies, hot chocolate in specialty mugs, and Holiday Time At The Disneyland Resort pins! From this amazing vantage point we enjoyed every moment of A Christmas Fantasy Parade. The parade was so fun and entertaining I couldn’t believe how quickly the 30 minutes flew by. We were all so disappointed that our tour was at an end. I just happened to have my comfortable, but basic wired earbuds in my park bag. My earbuds plugged right into the receiver. It was really comfortable to have my own headphones for the tour. Most of the adults did not have their own headphones. Those without headphones were provided an earpiece that sits over one ear. Unfortunately, this earpiece was too large for Elizabeth. Cast members found her old fashioned over the head headphones which worked out fine. I told her she looked like Star-Lord in them because they reminded me of the old Walkman headphones (sigh, I may be showing my age). If someone in your group has a food allergy and needs to use the snack vouchers I recommend grabbing something prior to the start of the tour. Cast members provide the food to attendees very quickly during the tour. If I had not pre-purchased an item (with the voucher) we would not have had time to obtain a safe snack while on the tour. I didn’t realize that we would be getting treats, let alone large travel mugs as part of our Holiday Time At The Disneyland Resort Tour. After the tour we found we had a lot more items than I had room to carry. Since we were staying at Disney’s Grand Californian my husband was nice enough to run the swag back to the resort for us. The Holiday Time At The Disneyland Resort Tour required considerable walking and standing. We made a loop around Disney California Adventure and most of Disneyland Park, too. 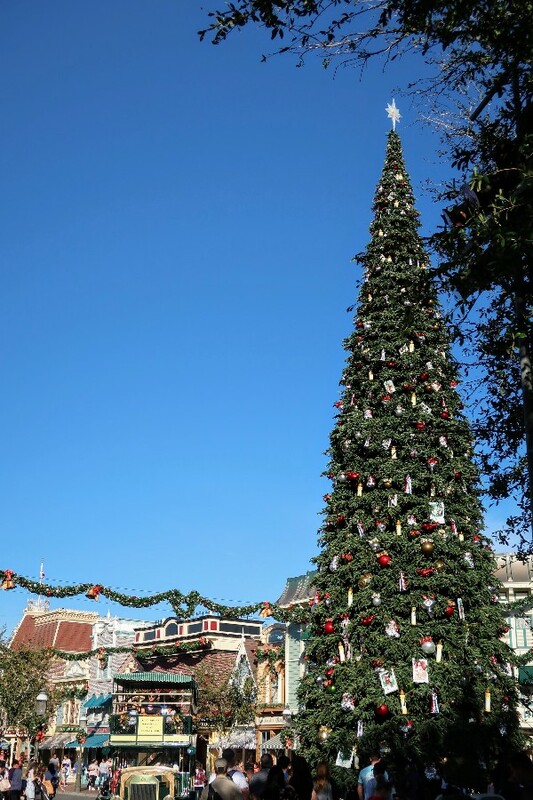 How Do You Book The Holiday Time At The Disneyland Resort Tour? Book tours in person at Tour Gardens or by phone at (714) 781-8687. 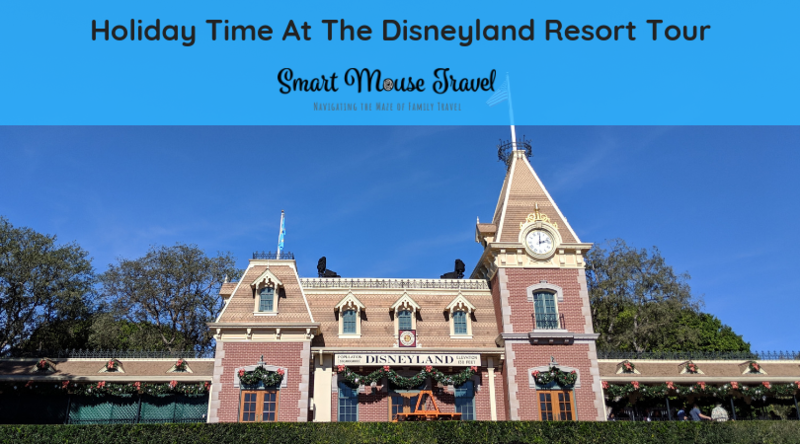 How Much Does The Holiday Time At The Disneyland Resort Tour Cost? During the 2018 season the Holiday Time At The Disneyland Resort Tour cost is $85 per person. Annual passholders have a discount so a ticket runs $72.25 per person. Please note you must also have valid park admission to attend the tour. On the way home I asked Elizabeth her favorite Disneyland Christmas activities from the trip. She said her absolute favorite thing was the tour and A Christmas Fantasy Parade. I really enjoyed the tour as well. My only regret is that we did the tour on our last park day. I think it would have been better to do the tour early in the trip. That way we could have gone back to look at things again later. The tour is available for kids and adults, however I think that some younger children might not care for the tour. Smaller kids may get antsy while the guide is talking or be upset you walk past attractions, but can not stop for them. You know your child best so carefully consider before booking your own Holiday Time At The Disneyland Resort Tour. This tour was enjoyable and the reserved seating for A Christmas Fantasy Parade was amazing. Kayla, our tour guide, was also knowledgeable and kind. She made the tour experience extra special for my daughter and has me thinking about taking a different Disney Parks tour sometime soon. Check out our other Disneyland articles to help plan your next trip.